Please tell me more about your work - do you do origami professionally? Yes, I am a full -time origami artist. I do installations, I make stop-frame animations using origami, I have products which I sell online and I do collaborations with other artists and designers, as part of my job. I say job, but its not really a job. I'm doing what I love so it's something I would be doing anyway. Which came first, the business or the 365 project? 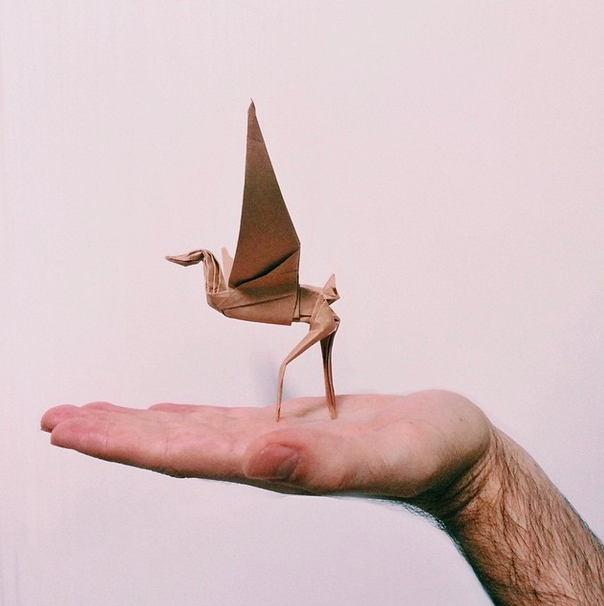 Had you been posting origami before the 365 project? How long have you been going for? The business was a result of the 365 project. I started an Instagram account at the beginning of 2013 and all I ever posted was pictures of origami cranes - which was all I could really fold at that stage. Over the course of 2013 I started folding other designs and models. I had been folding the crane for about 12 years before that. Did you start your side-project with the intention to improve your craft? Or what was the intention? I started the project to do three things - Do one thing every day for a year (which I had been wanting to do for as long as I can remember), to get better at origami and to finish something that I set out to do. I just wanted to do this for myself. I had no intention of impressing anyone or to get 'likes' or comments on my posts. All I wanted to do was get better and do something for myself. Has it been hard to keep to the discipline of daily posting? How have you coped with challenges? Were you ever tempted to quit? During the 365 project I didn't have any problems posting every day. I was folding pretty much every day leading up to the project so I just continued with that. I never once thought about stopping. It got a bit tricky when I was away for a weekend or on holiday overseas, but I did some preparation beforehand to make sure I had folded and taken a photo of a few figures before, so I just had to post it on the day. The biggest challenge was if I didn't have cellphone connection and I couldn't post! Haha. But I always managed to find a way. I have learned so much, not only about origami but about myself. Besides practicing patience over extended periods of time, I have learned to control my mind when it's behaving like a wild animal. Getting frustrated and moving past it quickly, planning properly, problem solving and many other things. When people ask what I do for a living I say I am an origami artist but like I mentioned I make stop-motion videos and take photos too so I don't really have a set title. But origami artist works right now. What have been your most epic wins (e.g. press coverage, business breakthroughs, proud moments...) so far? I worked out what I love doing. That for me is the biggest win. I've been searching for something I love doing and I've found it. What I love doing might change over the years but right now it's origami which I think about all the time and can't live without. What other South African 365 project should people check out? @meghanmaconochie - She does amazing pencil shaving art. @theletterm_za - He is doing the same as I did last year, a 365 origami project. Any general advice for people who want to launch a side-project or 365 project? Just start the project. Start it today. If you're thinking about where it's going to go or how many followers you're going to get (if you're doing it on social media) or how difficult its going to be, then you're doing it for all the wrong reasons. It's not something you have to think about. It will just happen. And most importantly, do it for yourself, because I don't think you'll finish it unless you do it for that reason. Choose something that you're doing already or something you want to get better at. It also doesn't have to be this big official "I'm starting a side project everyone, and its going to be awesome!!" Just start it, tell people if you want, but you don't need their approval. Just go for it.